Makeup and beauty !!! : Makeup and beauty first giveaway ! Makeup and beauty first giveaway ! As i promised to add a goodie for a each milestone so here i am with my first goodie to be added ! Next goodie i will add if i hit 75 followers ! Follow Makeup and beauty !!! on BlogLovin. Follow Toa Modak on hellocotton. In comment box below leave your comment that :-What you like and dislike about my blog? :) and leave the link of a post of mine not giveaways that you like or you think it is helpful. Non-bloggers can write guest post and earn 10 points for each post. · There will be only one lucky winner. · Winner will be announced on 3rd October 2012. · This giveaway is for Indian residents only. · I will be using random.org to select winners. thanks smita love you ! @Demi thanks.next time it will be international one ! Your b'day on 1st oct n mine 6th oct gr8. Hey,that nice ! Good luck.hope you win.Thanks for your participation ! Coming to your blog, I'm a new blogger, a new follower of ur blog and also new in this field. I'm still a learner. I found ur posts really nice and informative. I was thinking to read few of urs. Already gone through face care etc. But the posts wuith label "fashion" was the most attractive one. I loved it. You got beautiful jewelry and clothes. Totally loved them. I'll also try to buy few for myself. Thank you for following my blog, I'm following you too gorgeous! This is a lovely giveaway....I lovvve the O3 Kits! I loved your recent blog post on Oriflame brushes....I never really follow Oriflame products, it was good to know they do good quality brushes!!! Your jewelry and fashion posts are gorgeous as well!!! Thanks apoorva for your such a sweet comment and for your participation in my giveaway ! lovely giveaway! i liked your pre durga puja jewellery haul! Thanks smita for your lovely reply and participation in my giveaway ! hey gal...howz u..? ?very lovely giveaway dear...I like ur Pre dushera jwellery post...love the jwelleries . thanks Snigdha for your lovely comment ! And its a sweet giveaway.. Thanks appu for entering ! love u sweetie ! Thank You for doing this lovely giveaway! I entered ^_^. 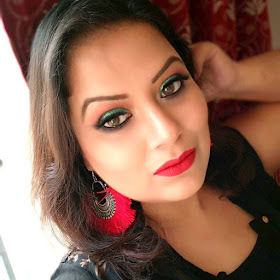 I love the jewelery post.I am a big earring freak.I keep collecting earrings.I loved the white pearl earring on ur blog.I will be searching it at my place n try to get it. hey amee ! my lovely sis ! thanks for participating ! u welcome sweetie ! @simpita thanks ! ur words means lot of encouragement to me ! because i have mild acne & the redness is pretty much seen so i need a good concealer no matter where I go. I can relate to this post cause showed me how i can glam up in a certain way where minimal makeup to no makeup is required. hey jyoti thanks for your compliment ! i love to do minimal makeup as me too have acne prone skin ! Thanks for the lovely Giveaway. I have just joined your blog and read a few posts. I love all your posts, especially the skin care, hair care and foot care. They are very informative and interesting. I love your way of writing. There is nothing that I dislike about your blog. I love your jewelleries in the post. hi bidisha thanks for your participation ! Hi and all the best for your first giveaway! hey shilpa nice suggestion...i will for sure ! luvly giveaway!!!! I love ur posts. the blog header and The sidebar blinkies.... luvd ur blog post on oriflame products.. I've entered your Giveaway ..Hoping to win and keepin my fingers crossed . .Hope you get all my entries. .Good luck to everyone. congrats..seems like u and smita were lucky in each others contests..